Morocco’s Foreign Minister Nasser Bourita underscored the strength characterizing the multilayered Moroccan-US partnership. All his interlocutors, he said, highlighted the “special” and “enduring bilateral strategic partnership which stood the test of time”. Bourita who paid a working visit to the United States Sept.17-18, held talks Monday at the White House with Trump’s national security advisor, John Bolton, and at the State Department with Secretary of State Michael Pompeo and other senior officials. Talks with Bolton focused on ways to strengthen the existing bilateral strategic partnership in the political, economic and security fields as well as on a set of regional issues, the situation in North Africa and the Middle East and the Sahara issue. These talks were held as the Security Council is scheduled to debate next October the Sahara issue with the renewal of the MUNURSO mandate on top of the agenda. 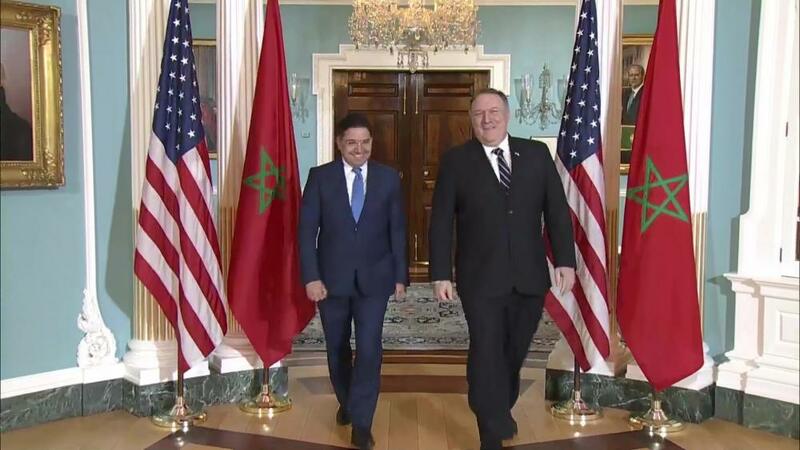 On the occasion of Bourita’s visit, the United States reiterated that the autonomy plan for the Sahara is “serious”, “realistic” and “credible”, stressing that it can satisfy the aspirations of the populations of the Sahara “to manage their own affairs in peace and dignity”. “We maintain that it (the autonomy plan) is serious, realistic and credible and that it is able to satisfy the aspirations of the populations of the Sahara to manage their own affairs in peace and dignity,” said Pablo Rodriguez, an official at the State Department. The Moroccan autonomy plan for the Sahara “represents a potential approach to resolving the Sahara issue,” the U.S. diplomat stressed. Nasser Bourita and U.S. Secretary of State Mike Pompeo agreed during their talks to hold the next session of the Morocco-U.S. Strategic Dialogue in 2019 in Washington. The two men also discussed opportunities to expand the two countries’ strong economic and security cooperation, including joint efforts to end Iran’s support for terrorism and counter its negative influence in the region. Bourita told MAP after the meeting that Africa and its development and security challenges will be a key feature in the strategic dialogue between the two countries, adding that the U.S. is aware of the role and contribution of the Kingdom in the promotion of peace and stability in the continent. On Tuesday, Bourita met with Senators Ted Cruz, Lindsey Graham and Todd Young. Talks focused on financial and military cooperation and on the Sahara issue. Bourita said afterwards his interlocutors both in the U.S. administration and in the Senate show “the same understanding of the stakes and the same awareness of the destabilizing actions led by the Polisario” in the region. Talks with U.S. officials also covered Iran and its connivance with the Polisario separatists as well as Morocco’s role in safeguarding regional peace and security, he said. Written by: Jaber Ali on September 19, 2018. Posted by Jaber Ali on Sep 19 2018. Filed under Headlines, World News. You can follow any responses to this entry through the RSS 2.0. Both comments and pings are currently closed.